causes abnormalities in flowers, which include shortened, discolored and streaked petals, enlarged calyx, straighten inflorescence, and abnormal development of floral parts into leaves (phyllody). False blossom imposed a severe threat to the cranberry industry in the US in the first half of last century. However, in the second half of last century, management of leafhoppers through the development of resistant varieties and effective chemical controls reduced its incidence. Recently, the disease has re-appeared in many New Jersey cranberry farms due to changes in management practices and the use of new (possibly more susceptible) varieties. To address this issue, the entomology program at the Rutgers PE Marucci Center is conducting studies to understand the effects of phytoplasma-infected cranberry plants on resistance to leafhoppers and other insect herbivores. 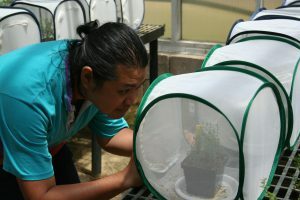 This research is being led by Nakorn Pradit, PhD student in the Department Entomology (Rutgers U.). We are asking two main research questions: 1. Are phytoplasma-infected cranberry plants more resistant or susceptible to leafhoppers and other non-vector insect pests? and 2) what are the mechanisms of this resistance/susceptibility? These studies will help identify possible mechanisms of insect pest resistance in cranberries and develop tools for improving control methods against insect vectors and other pests of cranberries.